The Western Nebraska Observer has been the award-winning source of news, information, opinion and sports in Kimball and Banner Counties since 1885. We are located in the Southwestern Panhandle of Nebraska on the historic Lincoln Highway and Transcontinental Railroad. Kimball and Banner Counties are the gateway to sites along the historic Oregon Train and Pony Express route. The Western Nebraska Observer is published every Thursday in broadsheet. 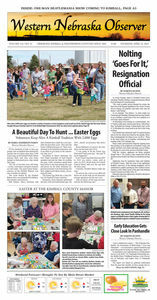 We also publish seasonal special sections, sports preview tabloids and other information/entertainment products. To advertise call 308-235-3631. The Western Nebraska Observer is a publication of Stevenson Newspapers, a member of the Nebraska Press Association and National Newspaper Association.